Well, the end of the year is here, which as always has one asking - where did the time go? Did we accomplish all that we had hoped? For the KSA, almost. We had set out with some lofty goals and I believe we made a respectable dent in the work we endeavored on. Let’s take a look at a few things. We had consistent and well attended KSA meetings, thanks to our past Chief Knights and core members who have been fixtures in our order for some time. We also had an increase in active new members who ignited a spark in the KSA, not only with attendance but with great ideas and work ethics. We assisted with both our Spring and Fall Reunions, held Knighting ceremonies for new members, and Elevation Knighting’s for deserving Knights. 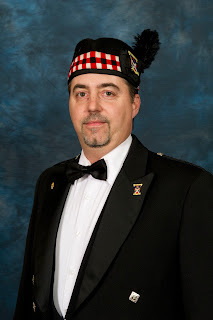 Greeting and assisting you in various ways at our Scottish Rite events, drafting and adopting new bylaws, hosting two events - the Scottish Highland games trip in September and our latest successful event, our “Cabaret Night” dinner and magic show in November. Our Knights have created our KSA website that you can find on the Scottish Rite site. The Chief Knight article is a new addition this year as well as his contact info on the Officers page. A special thank you to Brother Hank Vlcek, Illustrious Ken Nagel, our four Officer Bodies and Angela Athans, for encouraging and showing support for our order, which of course is YOUR order. Did we serve you well? I hope so. On December 1st we will be holding our annual elections which will usher in a fresh line of officers ready to serve you. All of our active members would like to thank you all for the privilege of serving this year. We are still not quite done - a few items left on our plate, continuing our momentum into the next year. As Chief Knight, it was an honor to serve, and I will remain an active Knight of St. Andrew hopefully for years to come. From all of the Knights of Saint Andrew, THANK YOU!